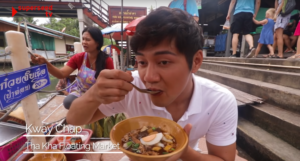 Home Food Samut Songkhram – the smallest Thai province with the biggest of hearts! Samut Songkhram is a small province located just southwest of Bangkok, along the Gulf of Thailand, just about 72 kilometers. It is a popular day trip destination for visitors of Bangkok. The word “samut” originates from the Sanskrit word samudra meaning ‘ocean’ and the word “songkhram” from Sanskrit saṅgrāmḥa meaning ‘war’. Hence the name of the province literally means ‘war ocean’. But do not be misguided by the somewhat menacing name, this place is anything but. In the video above you can follow Justin Foo as he journeys through the area and experience its unique quirks. Amphawa’s floating markets is one the bigger attraction for visitors from Bangkok. It is not hard to see why, the idyllic pace of life provides a much needed contrast to the hustle and bustle of city life. 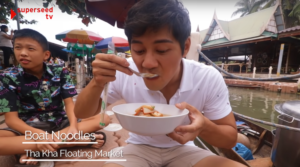 Two popular ones are Amphawa Floating Market and Tha Kha Floating Market, but there’s more to explore – as long as you’ve got an adventurous spirit and a huge appetite for authentic local eats! The unique blend of street food and river life is an interesting one. The canals are alive with boats floating around offering all sorts of goods. One of the most classic dishes in the area is boat noodles. A must try in Samut Songkhram! Boat noodles are rice noodles with sliced meat in a pig’s blood soup. It may sound quite exotic to many, but it is a flavourful dish that is deserving of its status as the signature dish of the area. If this dish is too far from your comfort zone, the next dish may be more suitable for you. Kway Chap! Many of you will know this as a Chinese Singaporean dish, but in Amphawa you can find Thai Kway Chap! The Kway Chap comes with fresh pork and may also come with pig blood. The noodle sheets that you get in Thai kway chap is actually rolled up — a “twist” to the flat and broad Singapore kway chap. The broth is brewed with Thai spices and the sweetness of the onion is easily noticeable! This is a must try for Singaporean visitors! Watch Out! 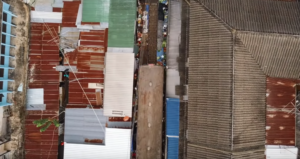 The train going through the market looks like a scene from a action movie! One of the most iconic markets in Thailand and a true eye opener for every visitor. The Maeklong Railway Market distinguishes itself from other markets in a big way! It has a train running through the middle of it several times a day. You can almost get anything you can usually get from a traditional Thai market, fruits, vegetables seafood, and of course a wide variety of Thai street food. But this is not it’s main selling point for it’s visitors. When a train is approaching a bell rings, and the vendors pull back their specially designed awnings before the train comes. The vendor’s awnings are pulled back only as far as necessary. The baskets of fruits and vegetables are shifted just enough as to not be sliced by the metal wheels. It is truly a unique sight you will not be able to see anywhere else in the world. The train passes through these tracks 8 times a day – here’s the schedule of trains departing and arriving at Maeklong Station for 2018! Train Arrival times: 8.30 a.m., 11.10 a.m., 2.30 p.m. and 5.40 p.m. Train Departure times: 6.20 a.m., 9.00 a.m., 11.30 a.m. and 3.30 p.m. If you wish to experience passing through Maeklong Railway Market aboard a train, tickets for departing trains costs a mere 10 baht! The many ingredients you will be handling in the cooking school! If you are a food lover and want to learn how to cook Thai food, you can follow Justin to the Tha Kha Thai Cooking School! Located in the amongst a coconut grove, the ambience is serene and beautiful. It is the perfect place to not only learn Thai cooking but also embrace the local culture. This cooking school will provide you a memorable Thai experience as well as some local recipes to impress your friends back at home! So next time you plan a trip to Thailand, don’t forget Samut Songkhram. It is truly a small province, with the biggest of hearts!